According to the Centers for Disease Control and Prevention, 1 in 59 children were diagnosed with autism in 2014. Because of the efforts of JSU’s Dr. Paige McKerchar, treatment options for children with autism and their families are improving. 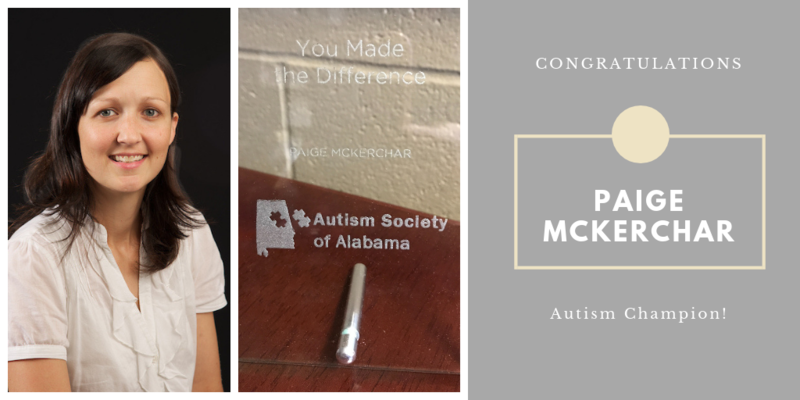 Dr. McKerchar, who’s head of JSU’s psychology department, has been recognized by the Autism Society of Alabama for her work with the passing of two legislative bills: Behavior Analyst Licensing Board and the Autism Insurance Reform. The Alabama Behavior Analyst Licensing Board legislation allows behavior analysts in Alabama to be licensed as required by insurance companies to receive coverage and reimbursement. Without this law, insurance companies would have refused to reimburse behavior analysts for their services because they were not considered licensed professionals. “The Alabama Behavior Analyst Licensing Board legislation also helped behavior analysts protect their right to practice, provided parity with other professionals, allowed for insurance reimbursement, and most importantly, protected consumers seeking behavioral analysis treatment,” Dr. McKerchar explained. The Autism Insurance Reform legislation requires that certain health insurance plans and contracts offer reimbursement for autism treatment, including applied behavior analysis (ABA) treatment. Dr. McKerchar started her career in behavior analysis as an undergraduate student at the University of Florida in 1998 working with individuals with a variety of intellectual and developmental disabilities, including autism. She has witnessed parents of children with autism as they fought to get insurance funding for ABA treatment for their children because it’s proven to be the most successful approach for improving skills in children with autism. According to the 2018 Behavior Analyst Certification Board (BACB) report, “US Employment Demand for Behavior Analysts: 2010-2017,” the demand for Board Certified Behavior Analysts has increased approximately 800 percent from 2010-2017. JSU is helping meet this demand. It has the only master’s program in Alabama that’s accredited by the Association for Behavior Analysis International (ABAI) Accreditation Board. Its Department of Psychology offers a Master of Science degree in psychology with an emphasis in ABA and has a Behavior Analyst Certification Board (BACB) verified course sequence. According to Dr. MerKerchar, JSU’s BCBA Exam pass rates have increased from 56 percent in 2015 to 80 percent in 2017, which is 15 percent above the 2017 international average of 65 percent.